Found this one on a remaindered-books table beneath The Strand during my most recent Manhattan trip. I’d never read the Epic of Gilgamesh in any format other than Wikipedia summaries before, so it seemed an apt purchase for the train ride home. Ferry’s work reads as smoothly as its cover-copy promises. Through it I found the epic to resemble, more than anything else, a thoroughly relatable black comedy focusing on ol’ Gil’s larger-than-life cluelessness: Derek Zoolander as demigod, too thrillingly stupid to know the futility of seeking immortality. 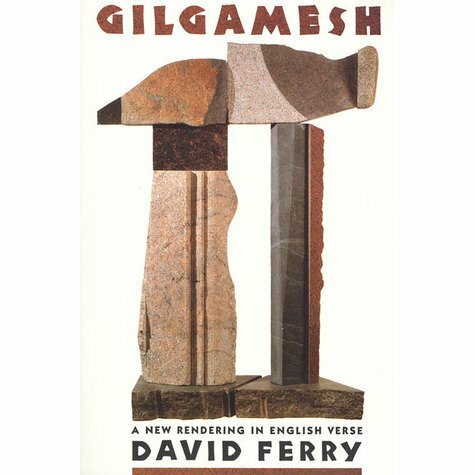 I’m not sure where Ferry’s work, published in the early 1990s, stands among contemporary Gilgamesh translations as far as reputations go. Both its preface and the author’s own endnotes go out of their way to note that this iambic-pentameter rendering of the ancient epic takes many liberties with the surviving tablets and fragments, basing itself on translations and inventing likely content of the sources’ lacunae. Indeed, now that I look again, the cover states “A new rendering in English verse”, avoiding the word “translation” entirely. In this volume, as in every telling of the tale, the gods create for Gilgamesh his wild-man life-partner Enkidu, so that he’ll stop mistreating his own citizens due to his boundless boredom. And inevitably, instead of staying put to manage his city, Gil and his new buddy immediately run off whooping to carve a gory path through the gods’ own menagerie of boss-fight monsters, hungry for immortality on the cosmic leaderboard, heedless of responsibility or retribution. When the gods respond to their violent idiocy by ban-hammering Enkidu, Gilgamesh, mournful and trembling, decides that immortal fame does not suffice: he wants to shed his mortality entirely. And so he tromps off to go find Noah, the Ark-builder, because he thinks he maybe heard somewhere that he and his lady figured out how to not die. (He is here named Utnapishtim, but clearly borne from the same source-legends as the biblical Noah.) And Gilgamesh succeeds in finding Noah, who tries to talk sense into him (and, by some scholarly accounts, inspires the Book of Ecclesiastes in the process), but this makes mighty Gilgamesh’s eyes glaze over. Noah and his wife then try to trick Gil into leaving, but he’s so thick-headed this doesn’t work either. Finally at wits end, Noah says: “Look… there’s, uh, a magic youth-restoring plant out yonder. Way far away from my house. Go find that and bring it back to your city. No, no need to bring it by here first.” And Gilgamesh says: “Well why didn’t you say so! Thanks, gramps!” And then he finds the plant, and then a snake eats it. So he goes back to his city empty-handed, and in a striking moment of grace pauses to quietly contemplate the walls of Uruk, describing them using the very same language that the epic’s narrator uses to set the scene for the listener way back at the start of the first tablet — back when Gilgamesh, bored and lonely, was ignoring his kingship and raising hell. Perhaps this means that Gil finally worked his ya-yas out and is ready to sit still and actually run the city that he seems to see for the first time? I get the impression from subsequent reading that Ferry did not wholly invent this lovely and unexpected cyclical callback, and that the original Sumerian tablets hold it as well. I think I vaguely knew that the Epic of Gilgamesh held its own telling of the Great Flood legend, but I had no idea that it fanfictioned right into it by supposing a meeting between monster-slayer Gilgamesh and ark-builder Noah, and I found this surprising and delightful and — in this particular rendering — hilarious. I feel very curious to see how it all comes across in a more direct translation. I found Gene Wolfe's epic SF novel from the early 1980s a rewarding read, despite (and, okay, partially because of) its somewhat dated presentation of female characters.